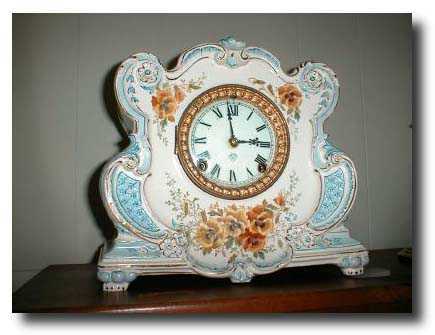 Royal Bonn Clock c. 1882 Dimensions:10 3/4" tall by 12 1/4" wide Maker/Mfgr./Author/Artist:Case Royal Bonn Co.-Germany; the movement and dial by the Ansonia Clock Co.-USA Condition:MINT Circa:CA 1882 (dated on clock) Materials:Porcelain case; brass movement; porcelain dial with fancy brass bezel. Description:The fancy script in which the first letter of the name is written could be either an "L" or a "T" or an "S". I have shown this clear and very legible inscription on the back of the clock to a dozen or so "experts" and most think it is "LA SOMME" which makes sense since that is the only French word of the three that can be translated. It means- "The Slumber". MINT condition. Does not have a outside escapement.